Big Game Hunting in Africa becomes more and more popular. It is the supreme discipline of hunting. The ever-growing quote of hunting trips to africa gives European hunters the chance to fulfill their dream of big game hunting. Furthermore the growing professionalism of the hunting outfitter raises the quality of hunting in Africa. You can find all the important information about big game hunting on grosswildjagd.de. Learn about where to hunt and what you have to consider when performing this art of hunting. We will give you a recommendation for which projectiles to use. Additionally we will picture the penetration and ballistics of these bullets. or all of the other big game in Africa. Next to the question about the fitting bullet is the one about the proper rifle for big game hunting in Africa. There are plenty of legal requirements to match. Therefore most big game hunters will need a special customized or modificated rifle. Big game hunting doesn’t necessarily refer to the size of the game. It’s called big game hunting because it’s so dangerous and difficult. Therefore lions, leopards, cheetahs and some antelopes also qualify for this classification. Most of this game can become very aggressive and dangerous for hunters. Especially when the shots have to be taken from close distances. This is why big game hunting is clearly not for beginners. Next to the close shots you have to accept the difficult terrain and big physical effort when big game hunting. This type of hunting is strictly monitored and regulated. For example you are not allowed to hunt a rhino at this moment, because of the reduced population due to poaching. Big game hunter seek for danger and exclusive trophies. Therefore big game hunting has its price. This is one reason why most hunters can only fulfill this dream once in a lifetime. Sometimes hunters have to fly more than once to Africa to get their trophy. The operators can’t give you a guarantee for your shot, because of the high technical and physical challenges of big game hunting. Hunting a leopard is every hunter’s dream. This beautiful cat is very hard to spot and very dangerous. Just a handful of european hunters had the pleasure of targeting a free-living leopard. The first big step to this exclusive trophy is to get a hunting permit. The second difficult and dangerous step is the hunt itself. 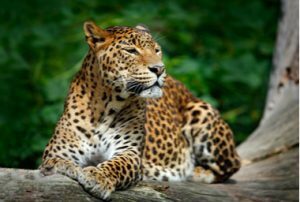 Only the most experienced hunting outfitters and scouts are able to spot a leopard, which is cleared to get shot. To get a hunting permit for an elephant is as difficult as for a leopard. Most of the time only the biggest and oldest elephants are cleared to get shot. Hunters are allowed to shoot this mighty and powerful animals close to their natural death. In this way it is possible to raise lots of money for the protection of nature and game. Most media demonizes big game hunting. However it contains the big possibility of raising money for the people and regions of Africa. Even the Convention on International Trade in Endangered (CITES) acknowledges this fact. The money raised by the hunting permits strengthens the protection of the African animals. It finances the war on poaching on one hand and the protection of the African people from the dangerous game on the other. Therefore big game hunters protect the African people and animals. Furthermore every big game hunt produces meat for the people. This meat is a blessing for the inhabitants of african villages. Whereas the big game hunter gets his exclusive trophy the African population gets their essential meat. The south of Africa is very popular within big game hunters. Namibia, South Africa, Zambia, Zimbabwe, Botswana and Tanzania are their favorite countries. Hunters enjoy the professionality of the outfitters next the to beauty of these countries. Unfortunately lots of the time hunters have to hunt where the permits are available instead of choosing their favourite country. Due to the small amount of permits a long term planning of the trip is necessary. The SuperPenetrator by Dr. Norber Hansen is a state-of-the-art projectile for big game hunting. Get all of the latest information and technical details regarding penetration, ballistics and construction of this bullet. Furthermore we will explain why full-metal round-nosed bullets fly straight through their target and give you a brief introduction of some types. Every hunting trip to Africa is special, because of its wilderness and animals. Therefore you should pick the right way of hunting to conserve this amazing nature. Stay away from morally wrong methods of hunting and you enjoy the pure wild of Africa. Giant parts of Africa are uninhabited. A hunting trip to one of these areas is every big game hunters dream. This so called “Safari Areas” could still be found in parts of Zambia, Namibia and Botswana. The “Communal Land” areas also allow the game to move without any restrictions. On the contrary to the safari areas these areas are inhabited. The big game is a threat for local farmers, for their fields and health. This is why these people take actions in to their own hand and start poaching big animals. In these areas outfitters try to license the hunt to raise money for the safety of game and farmers. Some of the big cattle farmers in South Africa and Namibia offer the possibility of hunting on their farmlands. Those giant areas, some thousands hectare big, are the perfect place for hunting antelopes in an save environment. Most of these farms offer a fair hunting trip. Although the amount of high fenced areas start to grow. On these farms the game has nowhere to go and is trapped within the farmland. Some of the big farmers build “Private Conservancies” where they merge their lands to build one big fenced hunting area. They often spend lots of money to install big game in those areas. 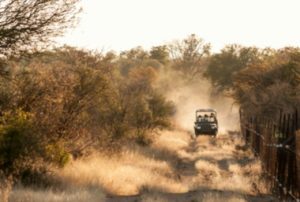 Those private conservancies bring back the memories of the “canned lion” hunting areas in South Africa. Those criminal organisations breed animals for only one reason. Most of the time those poor animals get shot during their feeding.